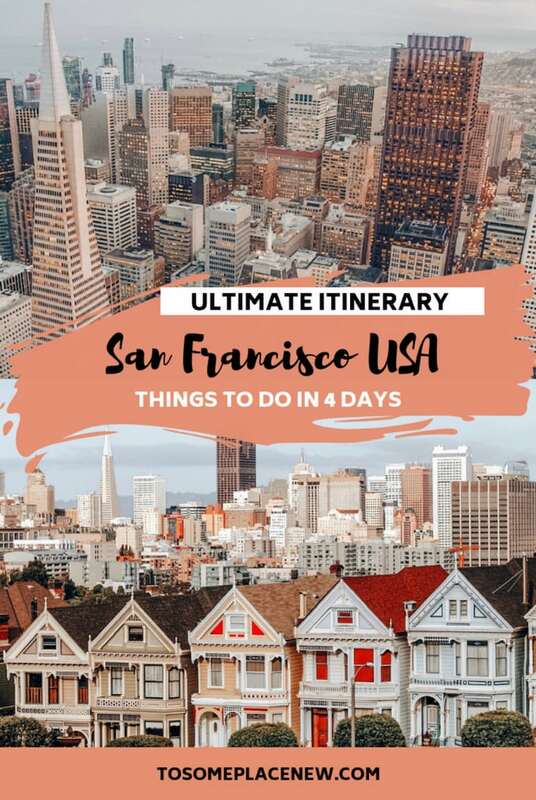 San Francisco is the sunny city of California and one of the bucket-list destinations that you shouldn’t miss. Its one of the most popular tourist destinations in the United States of America. 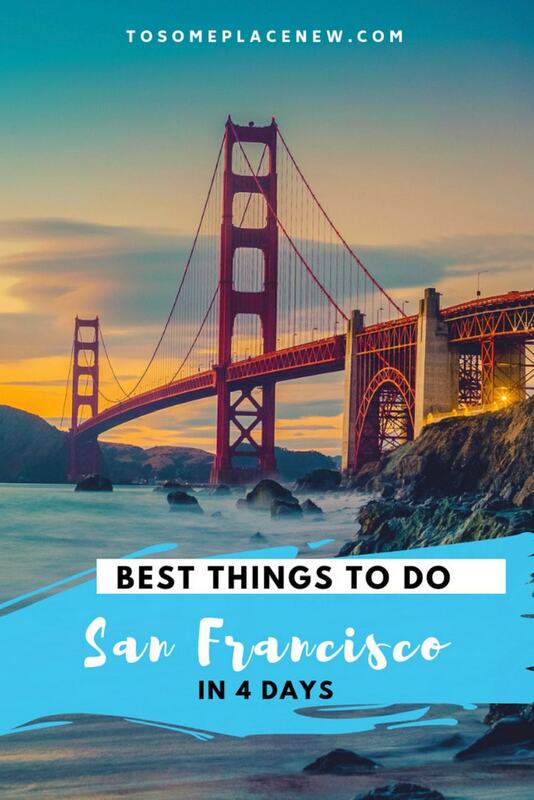 The city is known for its awesome weather, amazing landmarks like the Golden Gate Bridge, the Alcatraz, Fisherman’s Wharf, Chinatown district, Alamo Square (Full House shoot location), cable cars, Sausalito, Coit Tower to name a few. Over the years, San Francisco has received several nicknames, including “The City by the Bay”, “Fog City”, “San Fran”, and “Frisco”. It is also affectionately called “The Paris of the West”, or simply “The City”. 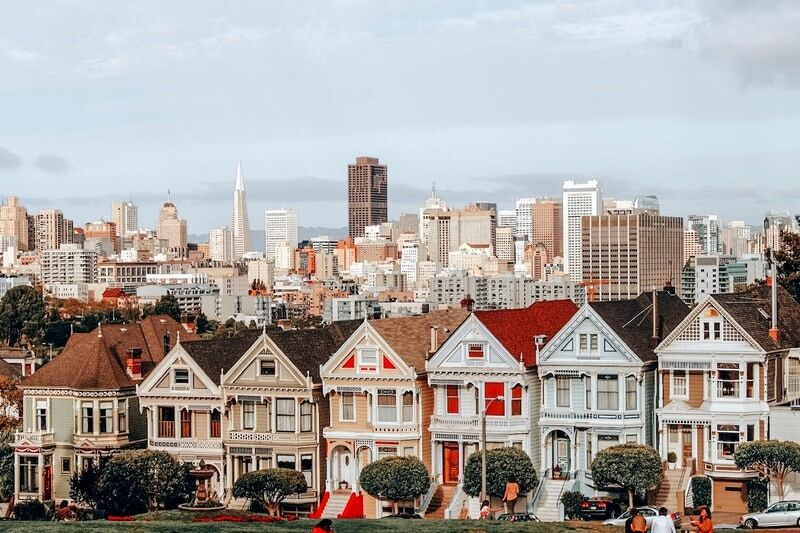 We spent 4 days in San Francisco and explored most of the city’s top highlights and more. 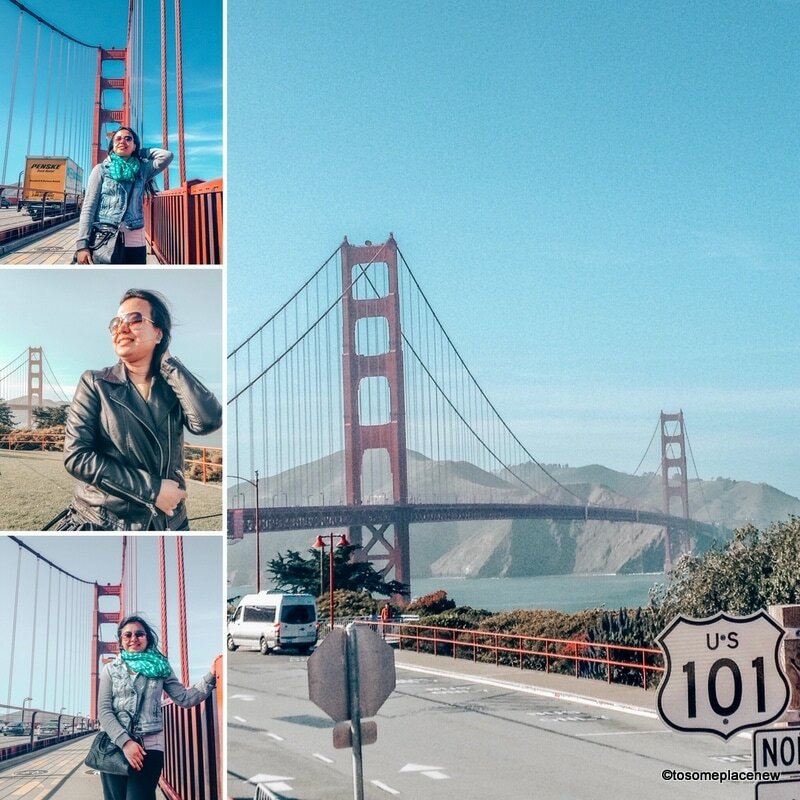 This San Francisco Itinerary is definitely a MUST read for first time visitors. If you are flying to San Francisco, look for cheaper flights to San Jose. San Jose is located 50 minutes away from the San Francisco Airport. Accommodation (hostels and hotels including airbnb accommodation) will be slightly cheaper in San Jose as compared to San Francisco. There are luxurious options for accommodation in San Francisco. Some of them offer stunning views of the sea and the Golden Gate Bridge and some come with great hospitality. The hotels mentioned here are located near Fisherman’s Wharf (the itinerary is structured with the Fisherman’s Wharf as the starting point, meaning less travel time for sightseeing). You can also consider staying in San Jose or MountainView. The only thing to remember is the commute (roughly 45- 50 minutes one way and the fare). Click here to browse for San Jose hotels OR hotels in MountainView. Food or access to trains are easy from these two areas to San Francisco. Start your first day in San Francisco with some coffee and crepes at the Fisherman’s Wharf. Take a stroll, enjoy the lovely breeze as you start your day exploring this new city. Fisherman’s Wharf is a well known neighborhood in San Francisco and quite popular with tourists. This touristy neighborhood is located along the waterfront area of San Francisco. It is filled with sea-food restaurants, cafes and souvenir stores. 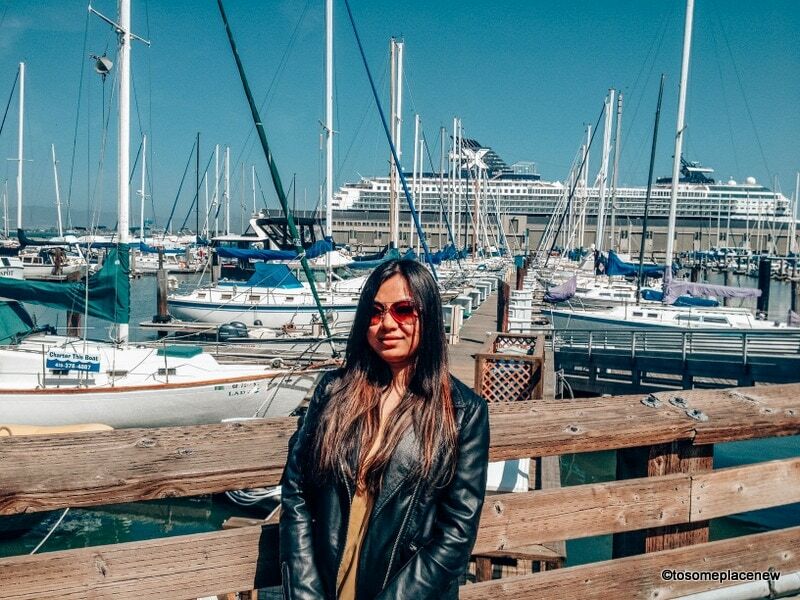 Most day tours to San Francisco area and around, start at the Fisherman’s Wharf. Fisherman’s Wharf has a long history, it speaks volume, of the sea and the fishing community and its contribution to the state. You can take a guided tour of the area to learn more. Within walking distance are the Ghirardelli Square, Pier 39, Pier 35 and the Ferry building. Ghirardelli Square is a restored neighborhood that once housed a Ghirardelli chocolate factory. Today it is a sprawling retail square. Pier 39 is another shopping center located at the Fisherman’s Wharf. 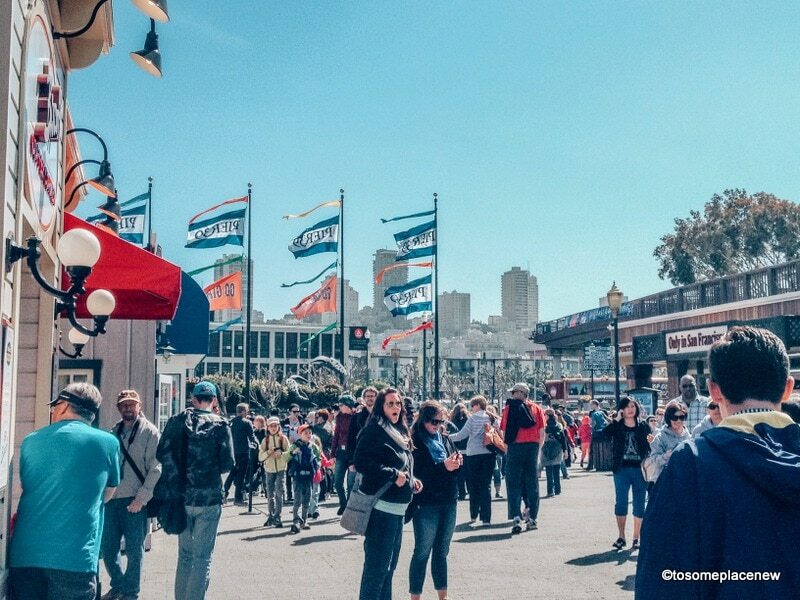 There are tons of activities to indulge in at the Pier 39. Although very touristy, everyday is a big festival here – with balloons, cotton candy, food, souvenirs and what not. This center is usually quite busy and is better to explore in the early hours when it opens. On the east side of the Pier 39 is the Pier 35 – the largest cruise terminal in San Francisco. You will also notice a big terminal close by, it is the Ferry Building. The Ferry Building was constructed and opened in the later part of the 19th century. The bell at the Ferry Building was inspired by the Giralda bell tower in Seville Spain. After all the sightseeing (and walking), settle down for brunch (or an early lunch) at the Fisherman’s Wharf. Try some fish and chips, with a light beer (c’mon, you are on vacation). From the Fisherman’s Wharf, you will see an island far away. That is the Alcatraz Island. 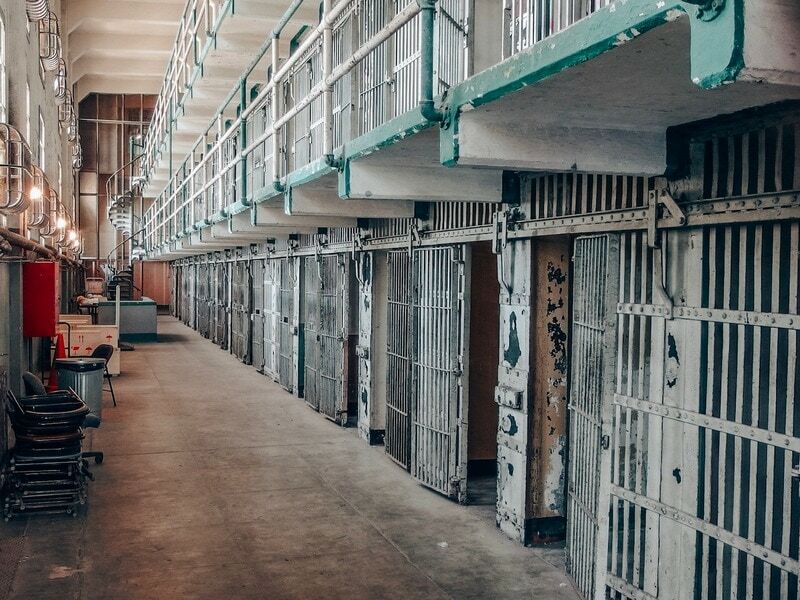 I remember watching a documentary on Discovery Channel about the Alcatraz prison and the atrocities meted out to the prisons – it is scary and gruesome. Today guided tours are available for visitors who wish to learn about its history. The Alcatraz Island first came into prominence when a Spaniard mentioned about Alcatraz – the land of pelicans. Over the years, a light house was created for sea safety. Due to its isolated location, Alcatraz was later used as a military fortification and a federal prison. When the federal prison was in operation, it was believed to have kept the hard criminals at bay. Most notorious of them all was Al Capone, who was imprisoned here. It is also believed that no one has ever escaped this prison. You can take a guided tour of the Alcatraz Island. You will have to take a ferry (15 minute ride on way) to reach the island and back (another 15 minutes), with a 1.50 to 2 hour guided tour at the island. Here is a guided tour of Alcatraz with a cruise. After exploring the Alcatraz Island, it will be late afternoon. If you want to relax and take your mind off from the dark history of Alcatraz, then head to Chinatown. It roughly takes about 12 minutes to reach Chinatown from the Fisherman’s Wharf. 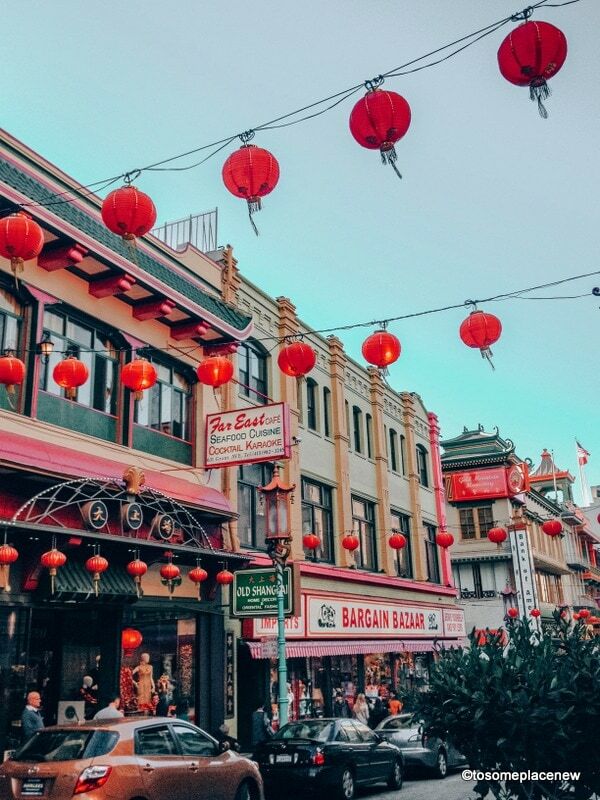 The Chinatown in San Francisco is the oldest Chinatown in North America. It was built in the mid 19th century and portrays the stories of Chinese immigrants to the country. What will take your heart away are the red lanterns that are hanging all over the neighborhood, along with the dragon gate. It is worth taking a stroll here and enjoying the ambiance. Everything here looks like you are in a different world altogether. This neighborhood had maintained many of the old traditions and customs for years. If you are hungry or if you LOVE Chinese food, try hot and sour soup, with Schezwan Chicken and noodles for dinner. They are delicious. After ChinaTown, you can either call it a day or spend some time at the Union Square area before heading to your hotel. Day 2 of San Francisco Itinerary is to check off the Golden Gate Bridge. 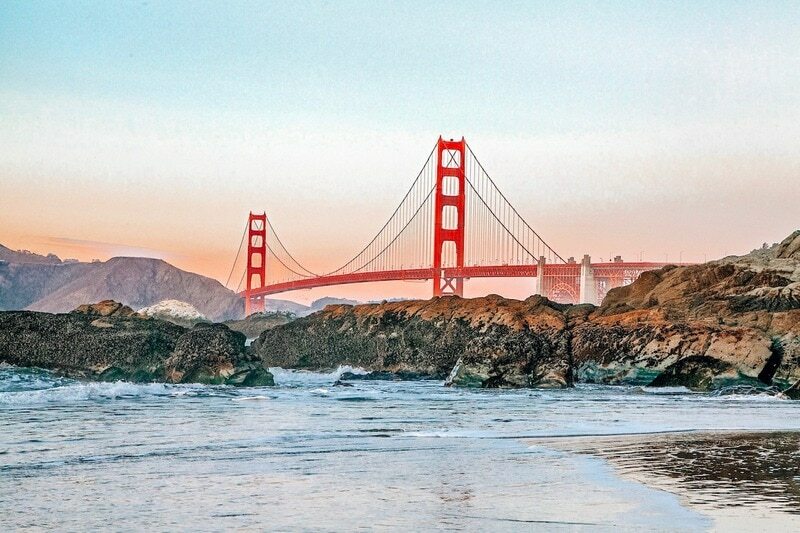 The Golden Gate Bridge is the city of San Francisco’s iconic landmark. So much so it is sometimes used synonymous with San Francisco as well. 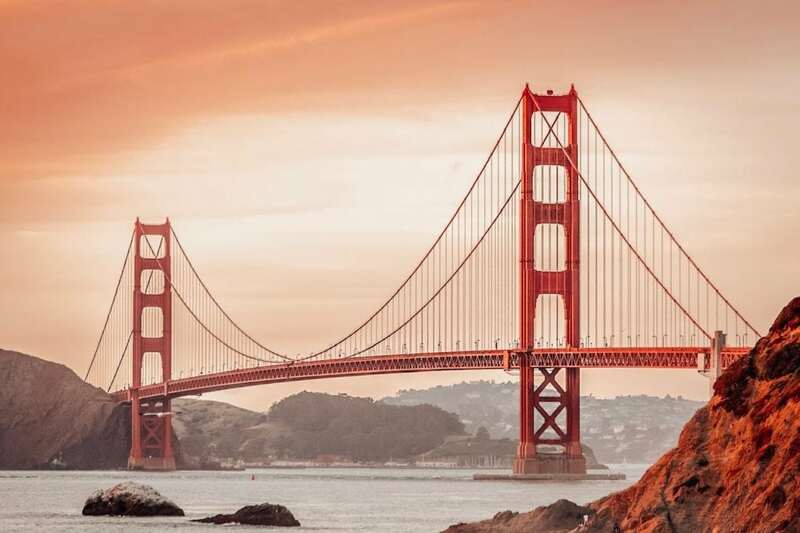 The Golden Gate Bridge is an engineering marvel and a California Historical Landmark. 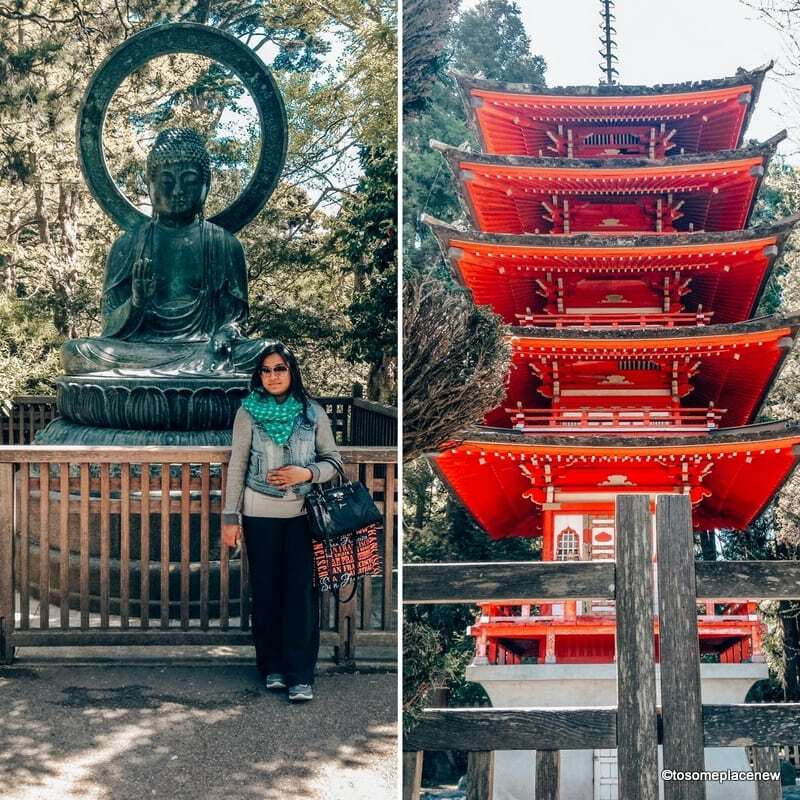 Today there are other areas like the Crissy Field, Palace of Fine Arts and the Japanese Tea Garden – which form a part of the Golden Gate Recreational Area. As you might already know, the Golden Gate Bridge is a suspension bridge. You can reach there by car or train or by taking a bus tour. Once you are at the bridge, you can walk across (like I did and took pictures) the bridge, learn about the bridge’s history and mechanisms at the information center or picnic at the Crissy Field. Allot 2-4 hours at the Golden Gate and the nearby recreational area. If you love to walk or take a light hike, then head to the Crissy Field. You can easily reach the Crissy Field by arriving at Fort Point (located just below the Golden Gate Bridge). Originally used as military airfield, today it is home to some of the stunning views of San Francisco. You can hike, bike or picnic here (they have designated picnic areas). Be camera ready for photographs. 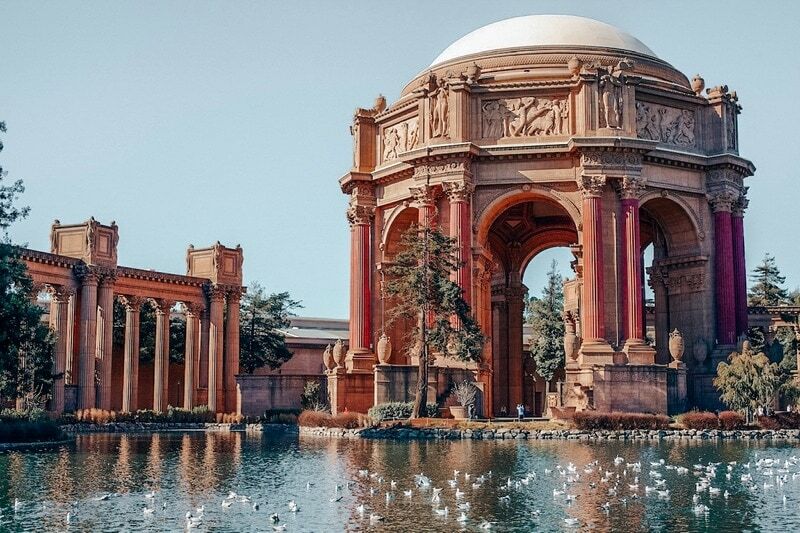 Located close to the Crissy Field is the Palace of Fine Arts. It is a monument structure that was built in 1915, for the Panama Pacific Exposition for arts exhibition. The original structure was completely demolished, with only the steel frame remaining on site. It was reconstructed later with lighter concrete material and walkways, and other structures were built around it. The Palace of Fine Arts gives a twist to the landscape with its Greco-Roman details. It is a popular events and wedding venue. From the Palace of Arts, head to the Japanese Tea Gardens. These gardens were created as part of World’s Fair and this oldest public gardens just stayed after the Fair/exposition. Over the years, many improvements and additions were made. The gardens are beautiful with Buddhist and Shinto religious structures and tons of greenery all around. My favorite structure here was the pagoda. Isn’t it pretty? The Japanese Gardens also has a tea house. Try some matcha tea here. After a fun filled but relaxing day at the Golden Gate, I think there is still time for absorbing more stunning views of the Bay City. Let’s head to Sausalito. 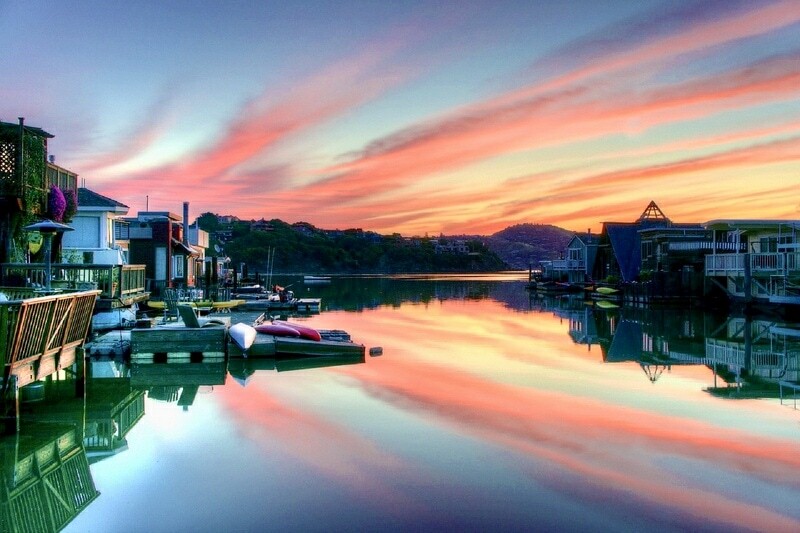 Located just a ferry ride away is the community of Sausalito. Sausalito is situated at the northern end of the Golden Gate Bridge. From the Golden Gate Bridge (south side of the bridge) it is about a 10 kilometre walk/drive to cross the bridge and reach Sausalito. It is a perfect way to enjoy a romantic dinner in this lively waterfront (but expensive and luxurious) neighborhood. Sausalito gets a steady stream of visitors due to its close proximity to the Golden Gate Bridge. Sausalito is a waterfront community and so you will find house boats of all shapes and sizes, yachts and of course fancy restaurants facing the Golden Gate and the sea. Rodeo Beach – Great for taking a stroll after dinner or just to watch the sunset in Sausalito. Day 3 of San Francisco starts with a beautiful morning at the Alamo Square. The Alamo Square Park is a residential neighborhood in San Francisco that was popularized with the TV sitcom “Full House”. Today visitors of the park and the city admire the painted ladies and you can take a stroll or picnic here at the park square. Try to arrive in the morning to enjoy the uninterrupted views (and also to score a parking spot). Spend as much as time as you like. This place does get busy around noon, so time to head for lunch. 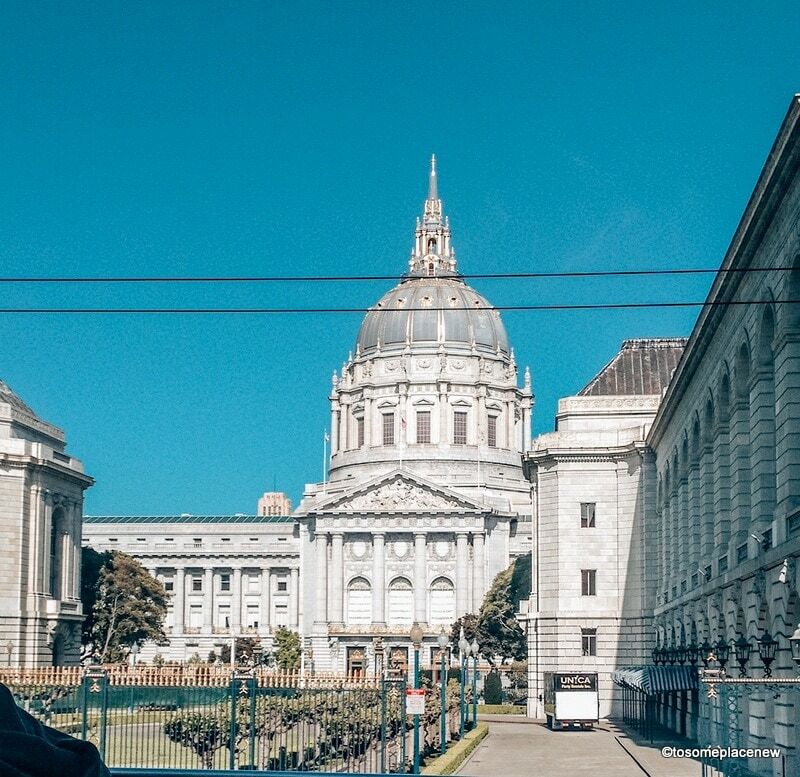 After lunch, head to the City Hall, located just 5 minutes away from Alamo Square. The San Francisco City Hall is the administrative seat of government for the City and County of San Francisco, California. San Francisco City Hall Docent Tour Program provides guided tours to the public. Tours are from 45 minute to 1 hour in duration. If you do not wish to tour the City Hall, we would still recommend admiring the monument’s architecture from the outside– it is beautiful. The San Francisco Museum of Modern Art is attracting local and visitors alike to its 170,000 square feet of gallery space in the Bay City. It is newly renovated with more displays in every floor (and more stairs). Tickets for adult entry are $25 USD (you can save upto 45% with the San Francisco City Pass). The SF MOMA is open Friday–Tuesday, 10 a.m.–5 p.m., and until 9 p.m. Thursday. They are closed Wednesdays. You can easily spend 2-4 hours here. More about the SF MOMA activities. From the SF MOMA, head to the Union Square. No, not to go back to the hotel. But to take a cable car ride from the Union Square to the Lombard Street. You must have seen images of steep, crooked street in San Francisco – that’s the Lombard Street. The Lombard Street stretches from the Presidio east to the Embarcadero. The crooked part of the Lombard Street is located in the Russian Hill neighborhood (eastern side). 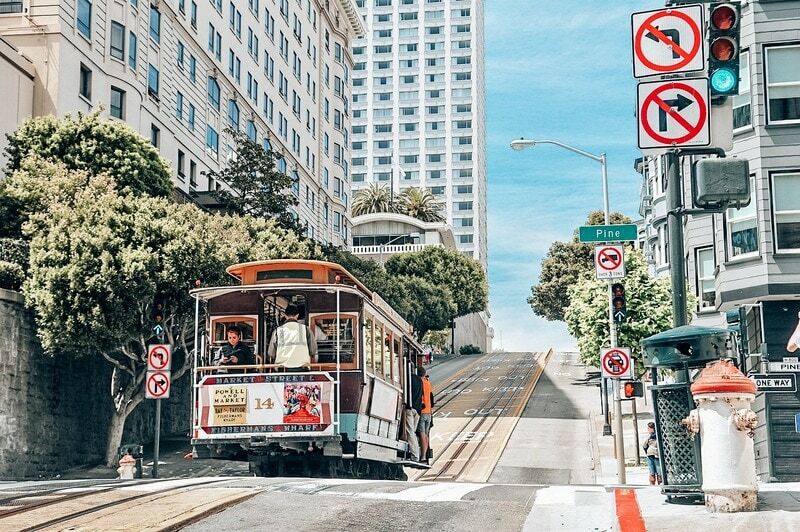 You can opt for a cable car ride, starting at the Union Square and taking you to the Lombard Street. The cable car operating here is the Powell-Hyde cable car – it takes you to the top of the block on the Hyde Street. San Francisco operates 3 types of cable cars – Powell-Mason (brings you to the Pier 39, Fisherman’s Wharf Area), Powell-Hyde (Lombard and Fisherman’s Wharf) and the California Line. For 4th day itinerary, take a day trip from San Francisco. If you like wine and are ready to splurge, then Napa Valley is a great option. 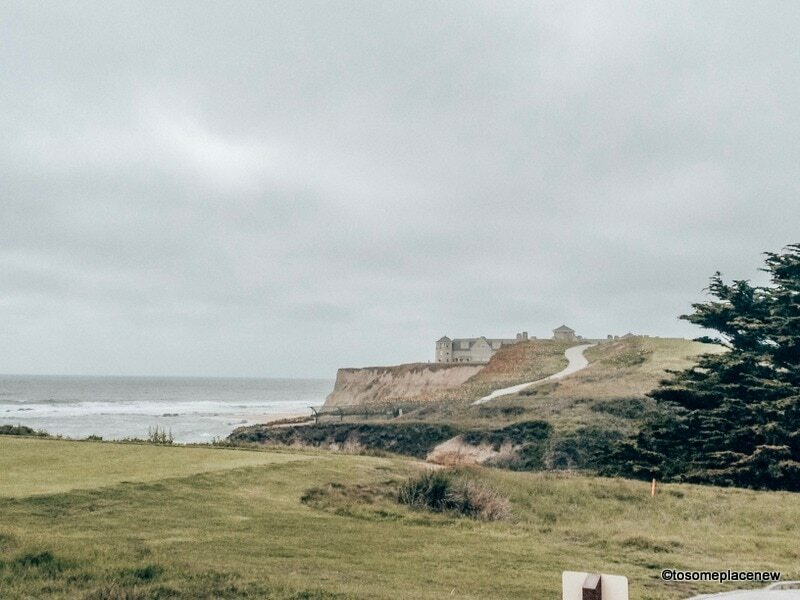 If you do not drink, but wish to take a day trip and explore more of San Francisco – then Half Moon bay is your answer! Located only 1.50 hours away from San Francisco is the beautiful Napa Valley. Napa Valley is known for its wine and picture perfect vineyards and if you are a wine lover (or love the countryside), this is a great day trip option. There are tons of day tour options for Napa Valley and typically they range for 6-8 hours. Here is a suggested day tour from San Francisco to Wine Valley Napa and Sonoma. Other then the Napa Valley wines, there is the Napa Valley wine train that runs through the valley and is a real treat to experience. You can also experience hot springs, gourmet food and in some ways get transported to Tuscany 🙂 Here is another Wine Valley tour, this one includes three wine tours and a lunch. You have to be 21 years of age to experience wine in the state of California. If you are not into wine and would rather visit a beach, then Half Moon Bay is the answer. Located in the San Mateo County, Half-Moon Bay is about 45 minutes (drive) away from Mountain View. This coastal town has a very laid back feel to it as compared to the bustling Bay Area. You can grab a bite or two to eat and hike or picnic in their beaches. The town that services the Half Moon Bay gives a very small-town vibe, with colorful stores and cafes. You can easily spend 4-6 hours at the beach and the nearby town (or the whole day, totally up-to you). In the evening, if interested you can head to see Infinity Loop (Apple’s Head Office) and some of the other Corporate Offices located in Mountain View and the nearby Bay Area. Stay in the Bay area for dinner in one of the multi-cuisine restaurants. Another option is to head to Mission District in San Francisco for the evening. The Mission District is a vibrant neighborhood with colorful murals, music and a hipster vibe. Enjoy the street art, do some vintage shopping and satisfy your taste buds with some awesome burritos. If you are traveling to the USA and do not possess passports from the 38 Visa Waiver countries, then a visa is required. US travel visas can be applied from your country of residence ahead of your travel dates. Tourist visa will allow you to travel and stay in the US for 6 months at a stretch. San Francisco is not very cheap to travel to. You can however, plan ahead and budget your stay within affordable means. On our visit, we found that on an average with 3 meals, coffees, transportation (taxi and CalTrain), you could spend around $125-150 USD per person per day. San Francisco remains sunny and warm throughout the year. September and October are usually the warmest months. December being the wettest and January the coldest months. We do recommend carrying a light jacket at all times, regardless of when you travel. It does get chilly (cold) in the evenings and night. Take a pack-able jacket with you. June through August are busy tourist months and things like – fights and hotels could be expensive. September and/or typical spring months are good for travel, especially March to April – before the busy tourist season kicks in. We were visiting San Francisco in April and the weather was pleasant, with occasional winds. Evenings were slightly cold, but bearable to walk outside and enjoy the evening or night. In December, although the wettest month, there are tons of holiday and Christmas festivals happening in town including whale watching at the Fisherman’s Wharf. If you are visiting the Napa Valley, consider coming in September to enjoy the harvest season. Things could get very expensive though for accommodation, but if you plan just a day trip, you will be fine. Hope you enjoyed our 4 day San Francisco Itinerary. If you are extending your trip, find some inspiration below. Extending your stay beyond San Francisco? Get inspiration for romantic getaways in California. I can’t believe I missed Alcatraz when I visited San Francisco! (I did make it to Angel Island though). Great travel guide! I love San Fran (especially because it is where I got engaged!) I love how you mapped out 4 day including a day trip to Napa! I love the Golden Gate area. I love San Francisco! You put together quite the itinerary and fit a lot in only 4 days. I have been many times and I never get bored. The view of the Golden Gate bridge never gets old. Thanks so much! We love to be on the go when we travel!